I just recently purchased a dehydrator and I’ve since been experimenting with various recipes. The main reason for making the purchase was so that I could enjoy one of my favourite childhood snacks: fruit rolls, also known as fruit leathers. It’s great to have on hand, especially if you tend to travel a lot. During the warmer months I’m an avid camper and nothing seems quite as satisfying as these fruity Paleo snacks. It’s just nice to not have to fuss with travelling with the equivalent quantities of fresh fruit. Also, if you have children, this is a guaranteed hit. It’s very easy to prepare, so it’s a great recipe to let the kids participate in. You can also prepare large quantities at a time, which is always good for when you have to make enough for a growing family. I must admit that it has certainly taken me quite a bit of experimentation to find a fruit roll recipe that I really enjoy. It can be difficult to find the right balance between sweet and tart. In fact, all the recipes I’ve tried containing a fruit with high amounts of acidity has been a flop. I also realized that less is more when it comes to dehydrating fruits. My guess is that the reason for this is because most fruits will take on more powerful flavours once dehydrated. Combining too many of these flavours can cause for very conflicting results. That being said, this apple cinnamon fruit roll recipe is the best I’ve prepared so far. What I like most about it is that a natural sweetener, such as honey, is not necessary at all when using the right kind of apples. You can use whatever kind of apples you prefer. Gala apples are a good fit in terms of their sweetness. Also note that the dehydration process can be completed in the oven in the event that you don’t have a dehydrator. Of course, like many other sweet Paleo dessert and snack recipes, these fruit rolls are quite high in sugar, even if its natural fruit sugar. It makes it easy to eat too much, especially since they’re so good, so it’s a good idea to still view them as a treat. Place the apples into a large saucepan over a medium-low heat. Add the water and cover. Allow it to simmer for 10 to 15 minutes. Stir a few times to make sure everything cooks consistently. 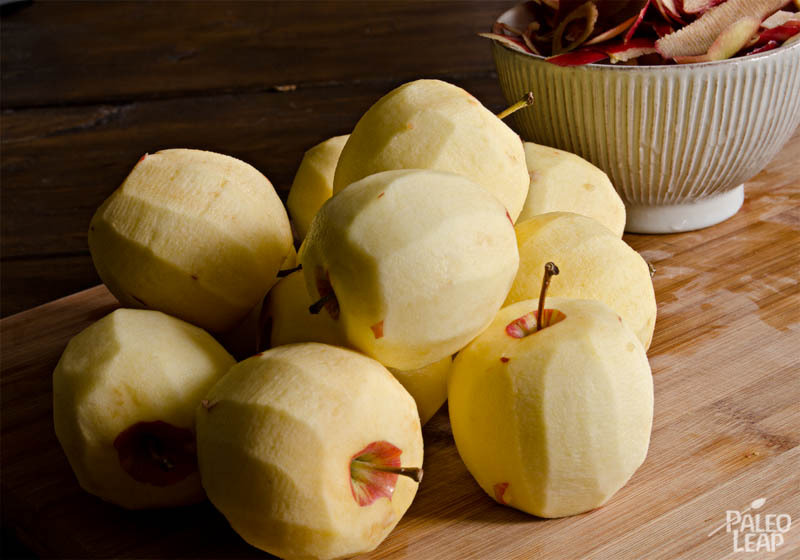 Pour the cooked apples into a blender and blend until smooth. Pour the blended ingredients back into the pot, still over a medium-low temperature. Add the lemon juice and cinnamon. Continue cooking for another 10 minutes. Spoon the mixture on to the appropriate dehydrator trays. Be sure to keep the mixture as level as possible for a consistent dehydration process. Dehydrate at 135 F for 10 to 12 hours, until the leather texture is achieved and when it peels off the trays easily. 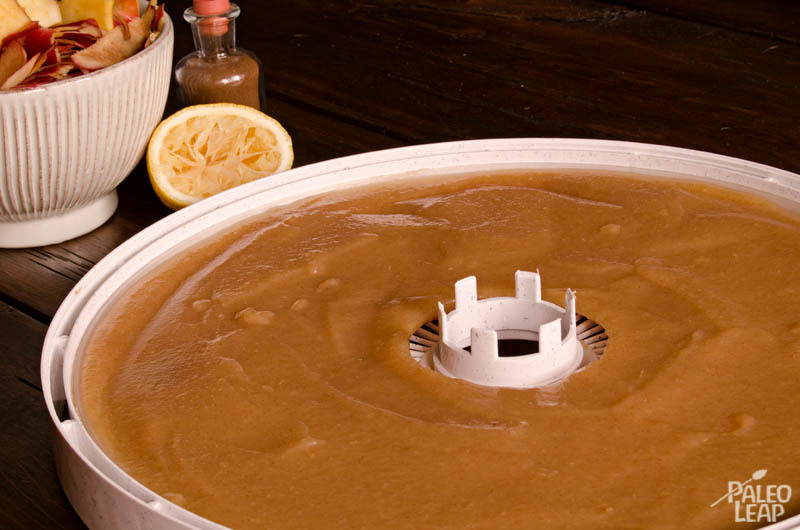 If you don’t have a dehydrator, this process can be done in the oven. Preheat your oven to the lowest temperature. Anywhere between 135 and 170 is good. Cook for 8 to 12 hours, depending on the temperature of the oven. 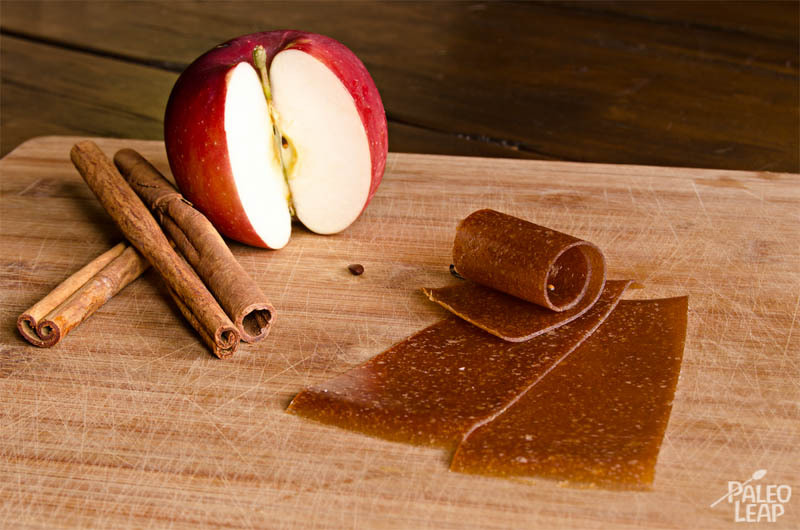 Cut the fruit leather into evenly shaped rectangles and roll them up to make fruit rolls.